What Day Of The Week Is August 27? 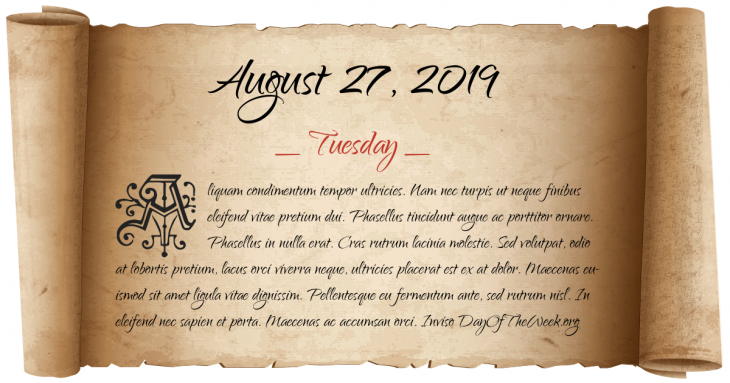 August 27, 2019 is the 239th day of the year 2019 in the Gregorian calendar. There are 126 days remaining until the end of the year. The day of the week is Tuesday. French counter-revolution: the port of Toulon revolts and admits the British fleet, which lands troops and seizes the port leading to Siege of Toulon. Wolfe Tone’s United Irish and French forces clash with the British Army in the Battle of Castlebar, part of the Irish Rebellion of 1798, resulting in the creation of the French puppet Republic of Connaught. Uruguay is formally proclaimed independent at preliminary peace talks brokered by Great Britain between Brazil and Argentina during the Argentina-Brazil War. Anglo-Zanzibar War: the shortest war in world history (09:00 to 09:45) between the United Kingdom and Zanzibar. An attempted coup fails in the African nation of Chad. The Government of Chad accuses Egypt of playing a role in the attempt and breaks off diplomatic relations. A Provisional Irish Republican Army bomb kills British World War II admiral Louis Mountbatten and three others while they are boating on holiday in Sligo, Republic of Ireland. Shortly after, 18 British Army soldiers are killed in an ambush near Warrenpoint, Northern Ireland (see Warrenpoint ambush). The Nigerian government is peacefully overthrown by Army Chief of Staff Major General Ibrahim Babangida. The European Community recognizes the independence of the Baltic states of Estonia, Latvia and Lithuania. Mars makes its closest approach to Earth in nearly 60,000 years, passing 34646418 mi distant. The first six-party talks, involving South and North Korea, the United States, China, Japan and Russia, convene to find a peaceful resolution to the security concerns as a result of the North Korean nuclear weapons program. Who were born on August 27?